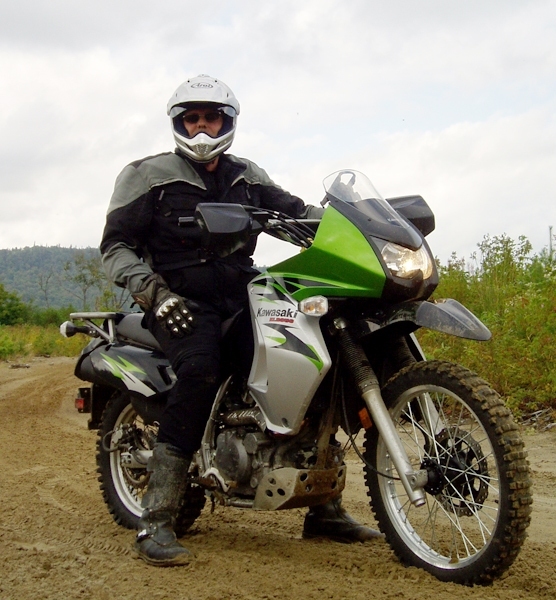 I first found out about Tekrider during the inaugural 2005 Paris-Dacre dual-sport rally. An Ontario company located in the small village of Kinmount, Tekrider make armoured vests for use by snowmobilers, ATV riders and off-road motorcycle riders too. The company’s headquarters had been chosen as the lunch stopping point for the rally, and although we were on a bit of a tight schedule I took up the offer from husband and wife team – Steve and Nancy Brand – for a tour around the facility. Steve Brand has a long history in the power sports industry as well as serving in the Canadian armed forces. It was during his time as Ski Doo’s North American terrain racing manager that he realized that there was no effective protection specifically made for snowmobilers, and as the racing evolved more into the world of stunting, resultant injuries were becoming an issue, as a result of the lack of suitable protection. After leaving Ski Doo he decided to tackle the safety gear issue head on and by February 1996 had the first working versions of the Tekvest. After a season of testing (both with snowmobiles and motocross), Brand launched the product in October 1996. However, it wasn’t until 2005 that the company decided to hit the ATV and off-road motorcycle market with their Rallysport Vest. The Rallysport can also be worn with white turtle necks for the ultimate in cool. 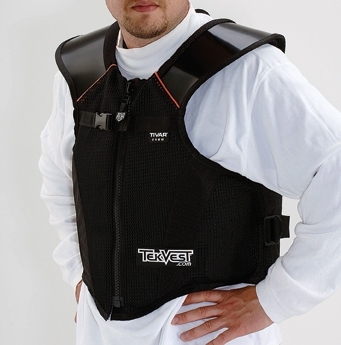 Looking a bit like an armoured vest that the military might wear, the Rally Sport vest is comprised of UHMW-PE (Ultra-High Molecular Weight Polyethylene) plastic panels, which boast excellent puncturing and abrasion resistance, while also being flexible, with a layer of high density padding for additional rider comfort. The vest consists of three main elements – the back, front left and front right, with the front elements connected to the back via adjustable straps at the sides and padded shoulder straps over the top. The front two elements are joined by a heavy-duty zipper, with a chest clip to allow the front to remain connected but the zipper lowered for additional venting. Each arm is armoured and adjustable. In the front are two zipped pockets and another two larger flap-and-popper pockets over them for general gear (I use them for maps, notebooks, pens and even my camera). Rear view shows meshed area to hold water bladder or indeed anything else you fancy. At the back is a large meshed pocket to hold up to 100 oz bladders, with a sewn in drink hose carrier along the left collar to ensure that the rider can access the water without having the hose flailing about. 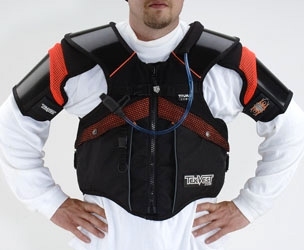 The vest is relatively short (coming to just below the rib cage), so as to allow for the use of most fanny packs and to ensure the rider maintains the necessary flexibility. Plenty of meshing allows for airflow between panels. The Rallysport is designed to be used over or under a jersey, or (in my case) under a textile jacket, with the back and shoulder armour removed (I keep the elbow pads in place to give me complete protection). This makes for a bit of a warm combination when it gets up there, although I’ve never gotten to the point off being too hot. For this year’s P-D I’ve brought some separate elbow armour and a motocross jersey that I’ll wear under the vest so that I can strip off the jacket should the temperature reach the uncomfortable point. Wearing the Rallysport under a textile jacket works well and adds to the “I’m built like a brick shithouse” look. Although the company states that you should keep the adjustments on the loose side for best cooling effect, I personally like to keep it tight as it acts a bit like a … well … err … how do a say this … corset! There, I said it. Yes, my aging bod just works better when it’s all strapped in nice and tight (especially over jarring terrain) and the Rallysport obliges in as manly a way as is possible. Thankfully I haven’t had to do the ultimate test of the product with a spectacular crash, but I have had a few tumbles at slow speeds and although the KLR has shown resultant dents and scratches, I have not. Above all, I feel a lot safer when I have it on. The only things I don’t like about the Rallysport are the bright orange meshing (I feel a bit loud when wearing it) and the non-removable arm and shoulder armour. Although these two factors are not an issue for dirt usage, I like my Tekvest so much that I now don it for longer road tours (protection, water supply, carrying bits and of course, the corset effect). I just feel a bit pf a plonker when I walk into Tim Hortons with huge shoulders and then take off my over jacket to reveal the bright orange finishing. Still, these are criticisms of a product that are because it’s maybe a bit too good! The Freestyle is a stripped down version. 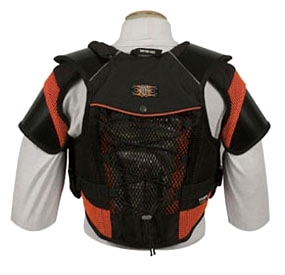 However, hardened bikers looking for a bit more protection (and maybe some non-girly like support) will be happy to know that this has been addressed somewhat by the addition of a new Tekvest, the Freestyle, which loses the arm protection, reduces the shoulder sizes and severely limits the orangeness. Unfortunately it also loses the water bladder holder, but then that might be a hard sell to the gnarly biker type! After almost two years, the Tekvest Rallysport has become a staple piece of equipment for me – both on and off the road and gets the full CMG recommendation. It is however, relatively costly, ranging from $420 to $440 dollars depending on size. The stripped-down Freestyle vest gets a significant price reduction, ranging from $220 to $300 (again depending on size), which I think makes a very useful piece of kit for the guy who thinks that dirt is only good for potatoes. Tekrider equipment can be brought directly online or through any dealer that carries Royal Distributing products. For more info, go to Tekrider.com.